Stonebridge Collective NOW has Gift Registry. Call the store for details at 816-765-0747. Here are some tips for decorating your sweetheart, head and guest tables. This is the moment to enjoy your newly beloved in the first shared meal. If you choose to go with a Sweetheart Table (just the two of you) you can use some of these ideas to make it special. Natural wood is trending right now. Try going with a flower boat. They sit low, are big enough to hold many flowers and still accommodate a candle, are light weight and affordable, and, perhaps more importantly, you can use them again in your daily life once you get home. Even if you choose a Sweetheart setting at the head table, this teak flower boat will define the space for you and your love and set you two apart. Head Tables have come a long way! When you have your entire wedding party join you at the head table, things can get cramped. Try some of these element to keep things simple and clean looking. 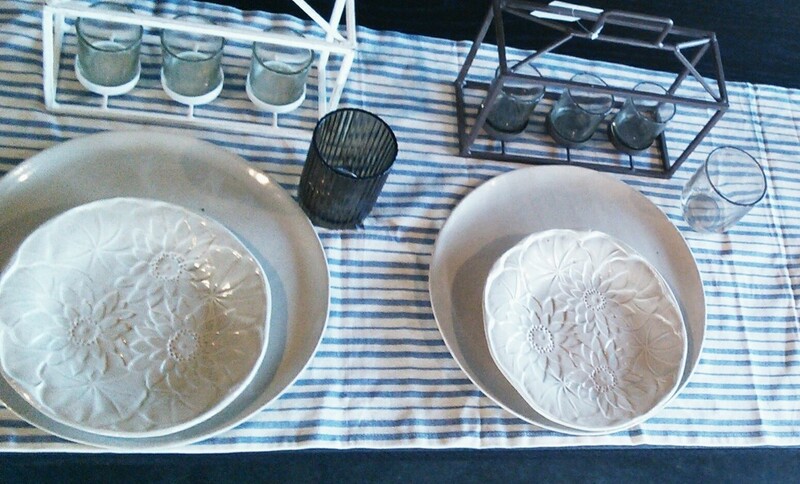 Hand crafted ceramic plates are usually slightly smaller than plates from a caterer. The smaller side plates are perfect for any course, salad, desert, or snacks. A table runner will help define the space for your wedding party. They have worked hard to make your event go off without a hitch to this point, make dining easy and effortless. Individual candle caddies will provide soft light for this amazing group of friends and still be easy to remove if you need to clear the table and make room for dancing. Mix and match vintage glassware is easy and affordable to use. These shown here are from a SET of 9 glasses. The set comes with a variety of shapes, colors and sizes making the effect look dazzling but easy to achieve. Centerpieces can enhance the experience for your guests. Some things to keep in mind when deciding on center pieces is the amount of them you will need for all of your tables and the size of each. Simple floral arrangements are crisp and lovely. Your local florist can make recommendations. Check out these options to make tables pop.